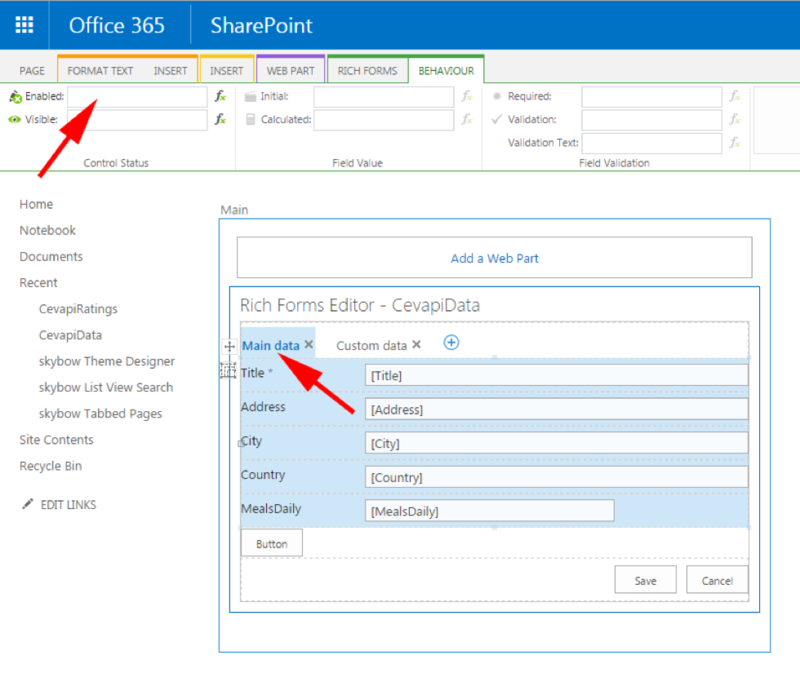 Rapid development of SharePoint and Office 365 business solutions with skybow Rich Forms. Our Matt and Adis have delivered an online webinar about skybow Rich Forms on July 13th, and we have received some great feedback and a bunch of good questions about it. skybow Rich Forms are so much more than an InfoPath replacement: a powerful visual forms designer, master-slave data representation, client-side data validation and aggregation (totals, sums...), customizable field behaviors, but also acting on data and data changes, through actions and actions links. 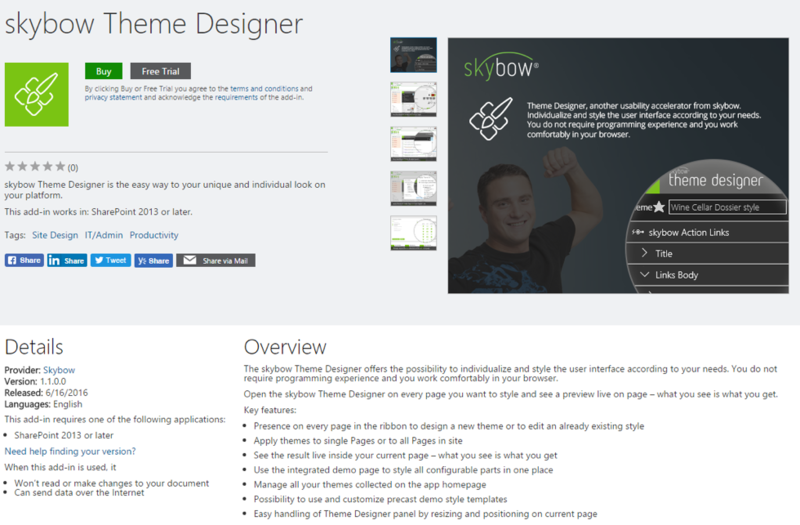 skybow Rich Forms speeds up SharePoint and SharePoint Online (Office 365) development to a great deal. Below you can find the webinar recording, download the answers on the questions we got during the q/a session after the webinar here. Niklas from Sweden is asking if the fields can be hidden depending on which SharePoint/AD group logged in user is member of? Yes, they can! In the field behavior menu, you can choose to customize either “Visible” or “Enabled” behavior. There you can set an expression when the selected field should be enabled or visible. Under the “Context objects” -> User, you can find the IsMemberOfGroup() method. This will work out of the box. Niklas is also asking if there can be different views, like in InfoPath? Absolutely! You can group your controls in the control containers (panels, tabs, etc…), and then set the visibility of those containers (show them or hide them) based on the context information – user, field values, etc. Aly from Nethelands is asking if it is possible to delete a form fields? Sure! 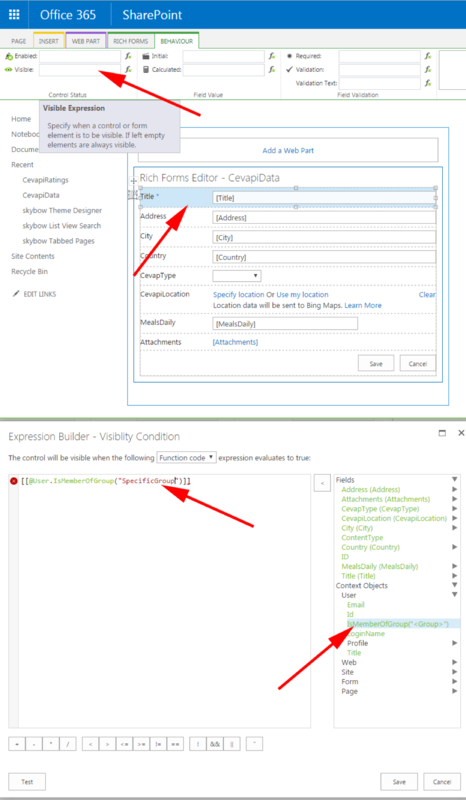 You just need to take care that if the underlying SharePoint field has been declared as required, you might experience unexpected behaviors. Aly is furthermore asking, if it is possible to add workflow interaction to skybow Rich Forms? Sure! 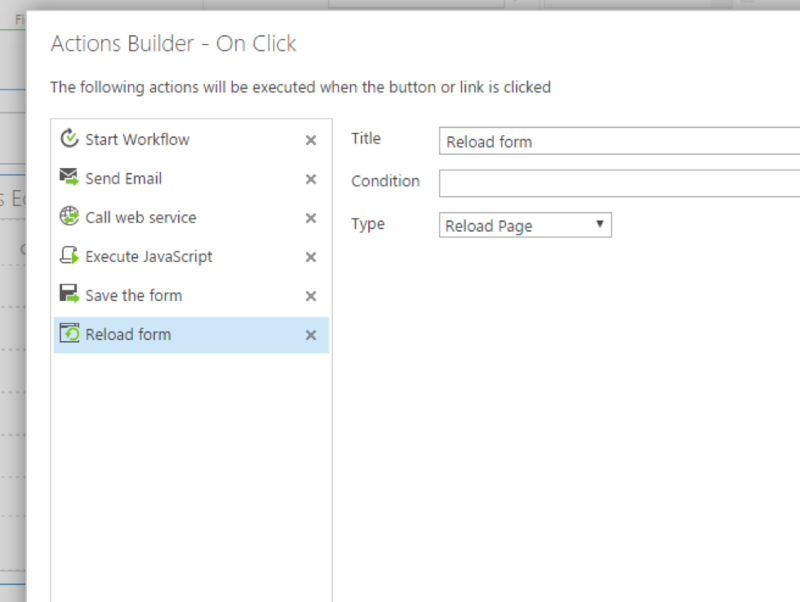 Among the actions you can assign to elements like buttons, you will find workflows. You can even set a condition to that workflow, for example, to start it only if the field “City” has value “Zurich”. 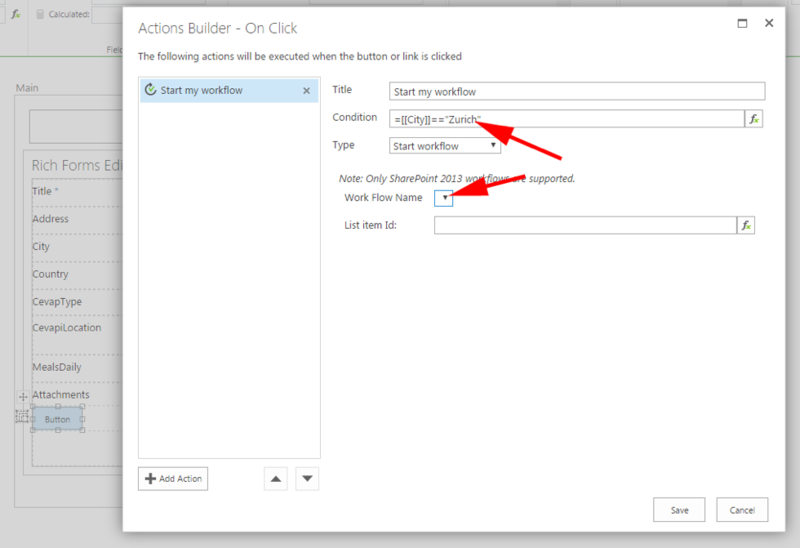 It has to be a SharePoint 2013 workflow (Workflow Manager), and it must be created prior to creating the action. Aly’s last question was if skybow has it’s own database, of uses any kind of SQL server in the background? skybow Rich Forms do not use any kind of 3rd party store, including Microsoft SQL Server. Data is kept only in SharePoint lists and libraries, there is no data replication of any way. Steen from Denmark was asking is it possible hide or lock a field based on membership? This was already answered in the Niklas’ question – yes, for each fields it is possible to “calculate” if the field is visible, enable, or even required. Input for that calculation can be any SharePoint field values, or context object values, like group membership, or combination of both. So it can be set that the field “Address” is visible only if the field “City” has been previously set to some value and the current user is member of “Contributors” group, and that field is required, only if the city has been set to Zurich. Tomasz from Ireland was asking if the access per tab can be specified, for example, that tab could be read only for a group of people, and another tab to be hidden? Sure! Tabs are just another container-style controls, and their visible/enabled behaviors can be set up just like with other controls. Remco from Netherlands is asking are skybow Rich Forms actions executed parallel or serial, and in order of bottom to top? Remco is further asking if it is possible to style the table cells / rich text boxes with css/html? Remco is also asking if is it possible to check in an item directly with the action button? The next question from Remco was are there any limits to formula, like max amount of characters. 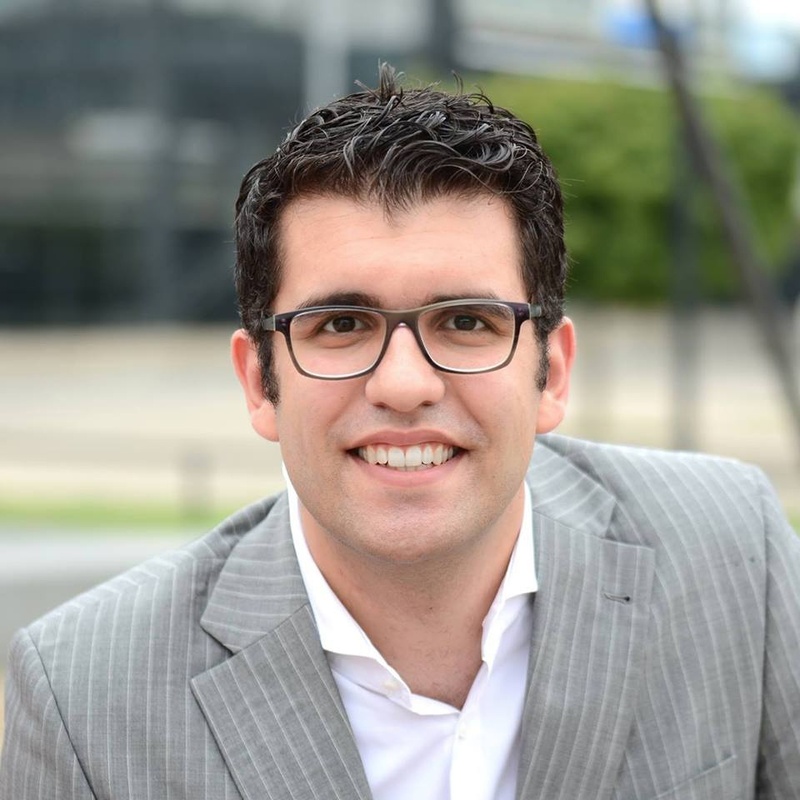 Remco is asking what is the difference between skybow Rich Forms and ardevia rich forms? There is none! Ardevia Rich Forms are now skybow Rich Forms, and it will be fully integrated with all other future skybow offerings. The last Remco’s question was what is the licensing model for the skybow rich forms. Stay tuned! We are soon to offer the whole range of licensing options, ranging from free to enterprise offers. Everything will be published on our web site.